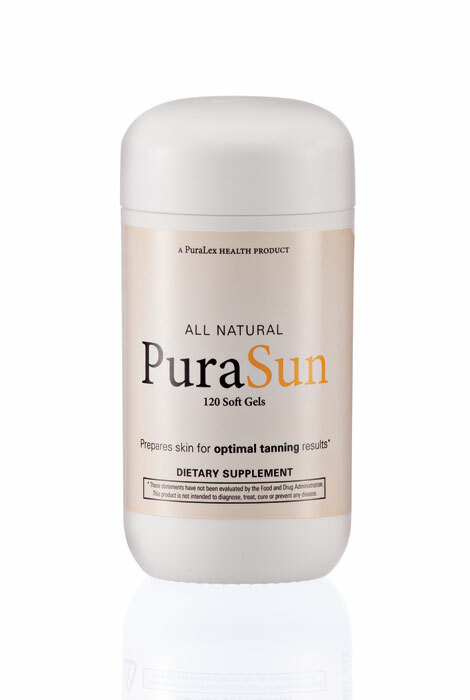 PuraSun™ tanning supplement is the next generation of sunless tanning. PuraSun™ offers a safe, natural-looking tan and supple skin with just two to four ingestible softgels a day. All-natural, hypoallergenic ingredients of this tanning supplement pigment skin evenly with no tan lines. Dermatologist recommended. 120-count bottle. Results will vary. Take the capsules at mealtime, with a glass of water. If used before and after sun bathing: take 2 to 4 capsules per day. If used during sun exposure: take 2 capsules twice a day. To maintain a tanned complexion throughout the year: take 2 capsules per day. I started using this product after a winter trip to Mexico as I wanted to hang on to my tan without visiting a tanning bed/booth. Event though theproduct is designed to help you tan faster, it really does help you maintain your tan. About a month later I took a quick business trip to Nevada. Had one afternoon in the sun and was amazed at how quickly I had color again even after using SPF 15 sunscreen. I can't wait for boating season to really put this to the test! I take two capsules each day, one in the morning and one in the afternoon. My skin maintains a soft, subtle, slightly tanned appearance; just enough color to appear to have recently been on vacation, and just enough to not have to wear makeup on most days. I am a 66 years old and very fair skinned. The self tanners often look streaked, orange or dirty on me, not to mention they are not attractive if your skin is not super smooth (i.e. crepey or wrinkled) Purasun is the perfect solution, since it is ingested, not applied to the skin. I get a very natural glow and have been using this product for years. Was plesantly surprized at how well these little vitamins work. I start taking them about May to prepare my skin for the summer months. I burn easily even with 70 spf lotion on and this product has given me 2 SUMMERS without a sun burn. Still use lotion (50 spf), but my skin has a nice tan base for the sun , now.I have recommended this product to several lifeguards, that liked how my skin looks and I haven't burnt. I am out in the sun everyday, THANK YOU PURASUN! On my first order I thought I would tan over night just by taking the pills! Not the case. When I went out in the sun my skin tanned very quickly and painlessly. I have been able to maintain my tan with very little sun exposure. I am now setting up PuraSun to be delivered monthly automatically! I love this product and I hope it works as well for you! Started taking it 4 weeks before I went to FL in May.I did not burn and I am fair. I always burn. Always use sunscreen but didn't worry as much as usual. Tanned more easily than ever befoe and in places I don't tan.Kept me golden through the whole summer with little sunning. Was also taking blood levels for Liver function and the product didn't affect the levels at all. Doc knew about my taking it. It is now the end of November and take 1 in the AM & PM. Still a lighter golden tone. Love this product. I use a self tanner/moisturizer/sunscreen on my face and don't expose my face to the sun. That's about the only place I noticed that PuraSun didn't seem to have an effect. Will keep taking it through the winter and into next summer. If it starts fading I will stop taking product until spring and start again for the summer season. Love this product!!! The color I get is more natural than any product that I have applied on the surface of my skin. And it lasts for months until you stop taking it. Then it fades gradually, without leaving any splotchiness. It is just a light glow which is perfect for my very fair skin. Normally, high doses of Vitamin A can be toxic, but that is if it is from animal products. Purasun is a vegetarian derived product, with no side effects. I am a red head and have very fair skin. I noticed a difference in less than a week. Take 2 per day. No side effects. I recommend this product for sure. I was a sun worshiper until I got skin cancer. Now don't waste time waiting for the sun to come out or waste time sitting in the sun. No tan lines. Color all year long.. I used 1 entire bottle as directed, and didn't see any tanning effects without the sun. After I was in the sun, I noticed a better tan than I would get without the pills - however, I had expected that there would be some degree of tanning from the pills without being in the sun. Haven't seen any results but am waiting. Too much whiz - no zing at all! After using this for a month I see no difference in my skin tone or color. Years ago I tried a product like this and had great results. I will try this for another month and then make my mind up about buying any more. I think that is the only fair way. I took this for about one week. After a few days my breasts were swollen and sore! I couldn't figure out what was wrong with me. I had a complete hysterectomy 6 years ago so I don't have PMS but that's exactly what I felt like. I figured out after a couple of days this was the only thing different I was doing so I stopped taking them. About two of three days later the swelling, tenderness and soreness was gone from my breasts. I guess this was a strange one in a million reaction. Just pay attention. If it happens to you stop taking them. I didn't have the opportunity to take them long enough to see any results. Useless..not what the description said. The description of the product implies that,you can get a tan"with no lines" meaning the product is going to tan you.The bottle says otherwise: basically that you still need the sun. I have done both for a while now and there is absolutely no change in my skin color whatsoever. Pretty useless product, waste of money.Do not buy. I've tried it before and I like it. It works, if you have a base tan. I quit tanning years ago, but think it looks "healthy" & covers well blotchy well. A little extra for summer! I do not tan well and get sunburned easily. read the reviews sounds promising. Will let all know how hit works. hoping for some color. I don't want the sun damage. I've used before and love it. I use this product all year because it gives me a healthy looking tan. I can go out without make up and look good. Repeat customer...'going on vacation and want to avoid sun. Have been using this item for many years, everyday. In order to have a steady, unobtrusive tan, you need only short periods of sunning, while before taking this product it took many hours in the sun to get the desired results.I love it---helps me to maintain my tan year round with a minimum of time and sweating. This is my third order. So I am getting the rest of the summer supply. It does take 6 - 8 weeks to see a glow on your skin. I am fair but have gotten lots of sun throughout my life. Getting in the sun enhances the glow. Seems to resist sunburning. Read some reviews on this item and practically all were 5 stars. So I decided to give a try. Hope I am just as satisfied. Looking forward to getting them. I used in the past and loved results. Going on a cruise and want a little help with tanning without baking in the sun or in a tanning bed. Reviews were good. Seems like an easy, subtle way to have skin look good in summer clothing. just hoping to get a tan without the harmful effects of the sun. We will see if it works without side effects. I take two tablets a day and maintain a glowing tan. People compliment me on my beautiful tan. Great way for getting skin ready for beach. I do not tan hardly at all so I thought I would give these a try. I truly feel they helped as my first weekend in the sun after taking the pills for a few weeks I had a nice tan. My legs are really hard to get any color on and for the first time in years I do have a tan on my legs I just bought another bottle to keep my tan and to see if I can get an even deeper tan. A friend tried it and with in 3 days we saw a tan. Hoping to have a beautiful tan prior to our beach trip. can you still get a tan without sun or tanning bed if you take theses tanning pills? BEST ANSWER: I have not tried getting a tan with the pills only. I use them to make my tan last longer, which they do. I take double the recommended dose - 4 pills at night and 4 in the morning. I started with the recommendd dose, and gradually increased my usage to get the results I wanted. The recommended dose did not produce the results I wanted. Thank you for your question. Take the capsules at mealtime, with a glass of water. If used before and after sun bathing: take 2 to 4 capsules per day. If used during sun exposure: take 2 capsules twice a day. To maintain a tanned complexion throughout the year: take 2 capsules per day. We hope this information will be of help to you. No you cannot get tan by taking this product. You still have to get in the sun. You can get a slight tan which I like especially in the winter months. Yes, but not quit the same, it will be a light tan. BEST ANSWER: Mine did not. What I did notice was I tanned faster and my tan lasted longer that it did without taking the PuraSun. I was in the sun only on the weekends and did continue to use sunscreen which is definitely recommended with any sun exposure. No your skin will not look orange. Your skin will tan as it normally does. This product helps speed up the process of normal tanning. No side effects at all. It is a great product. This product did not make my skin look orange, but just as with most supplements, individual reactions may vary. no, I am a redhead and it didn't me. BEST ANSWER: After using for 6 years, there have been no side effects and I get liver function tests every 6 months and all is well all the time. Love this product but I do stop taking it during the dark months. Take it March thru October. Check with your doctor if you are not comfortable. I have. No, none--and I have been using these before vacations for years. Start three weeks before: when you go into the sun, you tan three times faster. In two days, you look like you have been out for a week and I ALWAYS use an SPF 30 btw. Of course, these do NOT work without sun exposure. I have used this product for two years. I have had no side effects. It really works. You tan much faster with these pills. Once you have started tanning you only have to take two per day to maintain tan. I think you'll be happy with product. Thank you for your question. We have not heard of any side affects, however, please consult your doctor before starting any regimen.We hope this information will be of help to you. I have not experienced any side effects from this product. Will it make age spots look darker which is what I now get with using a sunless tanning lotion? It would be nice to get a tan without having the age spots stand out and look darker making them more noticeable. BEST ANSWER: No, this product does not make your age spots look darker. I like it because i find it prevents me from burning. I would recommend this product. My age spots are actually lighter, but I am using Bremenn Clinical Dark Spot Eraser on them and I use only 1 soft gel PuraSun a day. Thank you so much for replying. That has helped me make up my mind to give it a try along with the age spot cream you suggested. I really appreciate your reply!! I was under the impression that this was a sunless tanner from the description in the catalog,so I was not very pleased but had already thrown out all paper work and packaging.So now my question is this,what exactly does this product do ? It is called Pura Sun,and since I have a skin disease that prevents me from being in the sun,I really don't know what it can do for me. BEST ANSWER: It makes me tan more quickly and keeps my tan, but it doesn't tan without being in the sun.